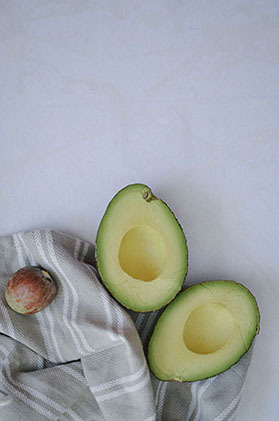 If you give a food blogger an avocado, she’s going to want to create a blog post about it. She’ll probably want to take pictures of the process and she’ll need lots of natural sunlight to do this. Taking pictures will stir up her appetite, so she’ll want to grab a donut with you. She’ll take you to the local donut shop, which will offer crazy flavors instead of the classics like original glaze. She’s going to stare hard at the menu for a while, until she finds the wildest option. She’ll want to take a picture of her unique donut and share it on Instagram. While thinking of a witty caption, she’s going to edit her picture with VSCOcam so that it looks more “artistic”. As she eats her donut, she’ll start to think of creative ideas for future blog posts, and she’ll jot these ideas down on her iPhone’s notepad. On the way home, she’s going to ask about your favorite recipe in Sara and Hugh Forte’s new book Bowl + Spoon, but when you start to respond, she’s going to get distracted by a farmer’s market in the neighborhood. She might notice that ramps are in season and with much enthusiasm, tell you that they are only available for a few weeks in the year. That will remind her of an interesting ramp recipe she saw last year and she’ll want to adapt her own recipe from it. She’ll probably to convince herself to gets groceries, since she’s already out, for the ramp dish. She’ll buy extra ingredients to stage her shots with, so only the prettiest produce will get selected. She’s going to spend 15 minutes picking one onion, and she’ll annoy all the customers around her. When you’re finally at the checkout line, she’ll probably recognize the cashier. She’ll tell you that she comes here often and they know each other by first name. She’s going to get worried about the amount sunlight left in the day, so she’ll want to rush home to finish taking pictures. She’ll probably start her post with “GUYS!” and use the word “delicious” four or five times. She’ll remember something funny that happened during the week, and she’ll want to talk about that too. Before publishing her post, she’s going to get hungry again, so she’ll probably want an avocado. And chances are if she gets another avocado, she’s going to want to create a blog post about it. The story above was adapted from one of my favorite children’s books If You Give a Mouse a Cookie. I think it was always a favorite because I can totally relate to the mouse. We’re both easily sidetracked. The New Yorker did a little parody on it, and because it made me really giddy, I decided to write my own! 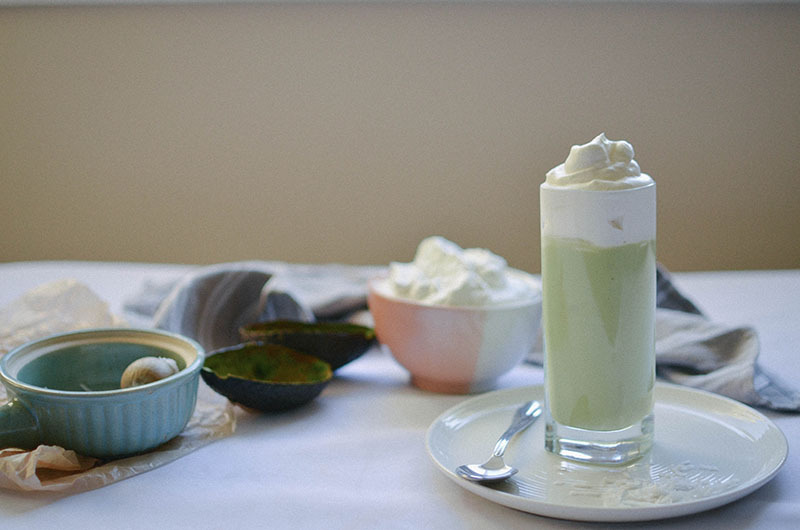 The recipe for this sweet, creamy avocado smoothie is adapted from In Search of Yummyness’ Vietnamese avocado smoothie. 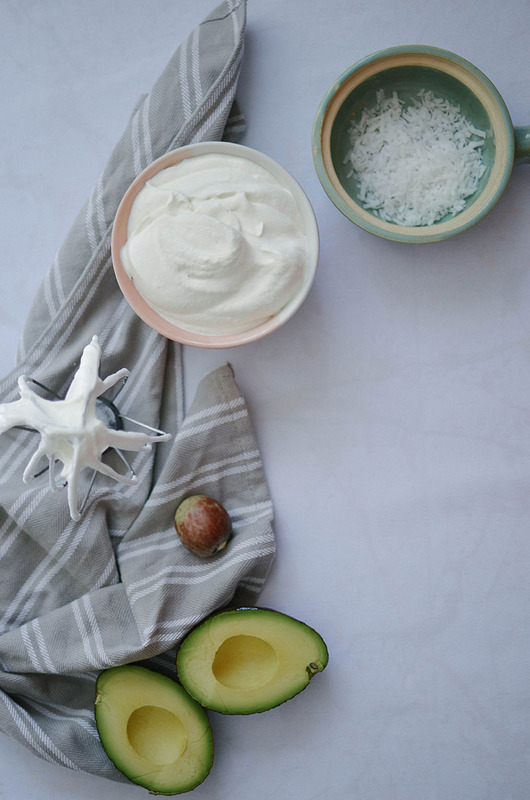 To make this extra special, I topped it with a simple honey whipped cream because honey and avocado make such a beautiful couple. I enjoyed my Saturday with this smoothie in one hand and a good book in the other. 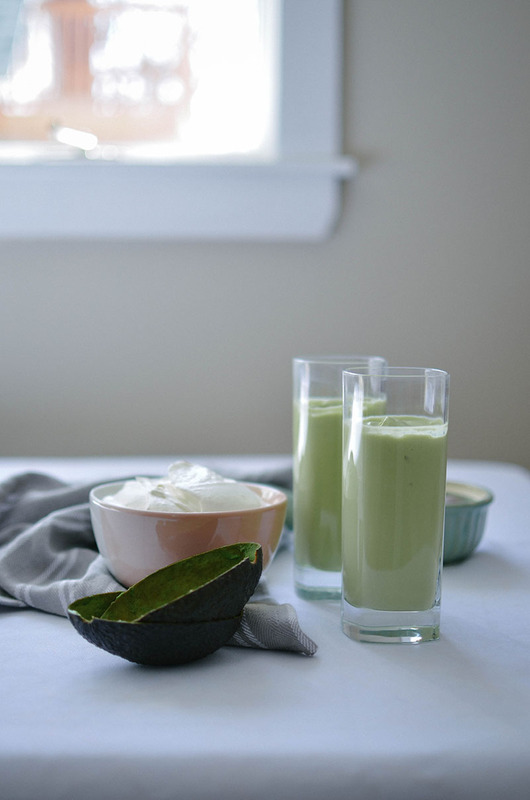 In a blender, blend all the ingredients for the smoothie, then pour into two tall glasses. 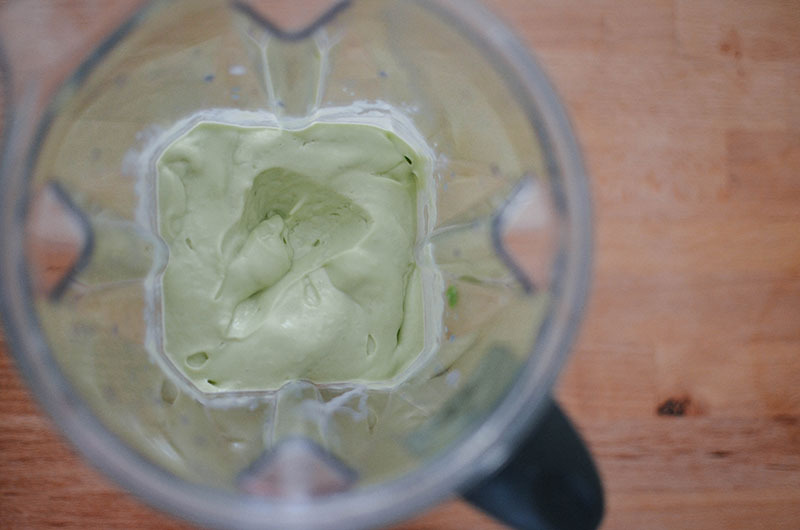 With an electric mixer, mix the heavy whipping cream on medium speed for 2 minutes. Slowly add the honey, and increase the speed to medium-high. Whip just until the cream reaches stiff peaks. 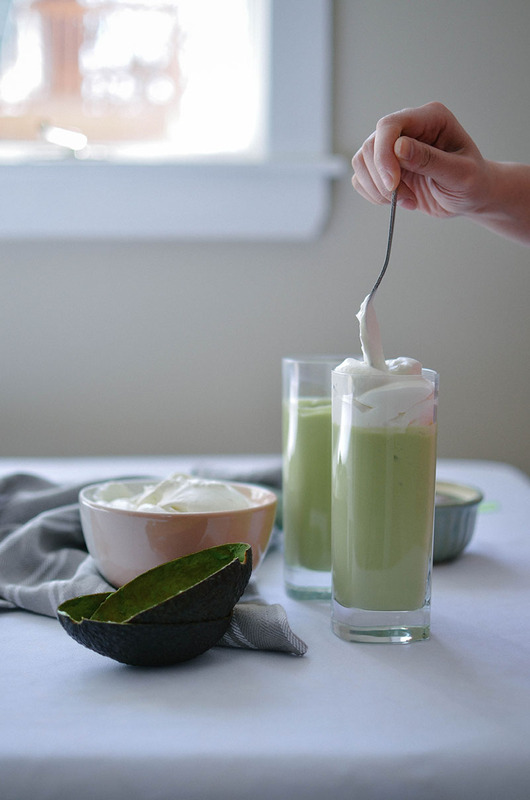 Top the smoothie with whipped cream, and serve immediately. 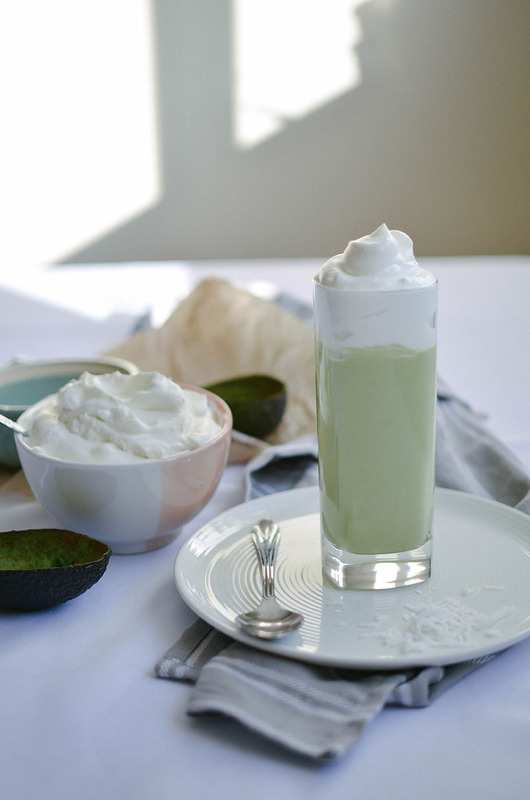 This entry was posted in Beverages and tagged avocado, honey, smoothie, sweetened condensed milk, whipped cream. You are too sweet, Rebecca! Thank you!! I’m obsessed too – I love the Sprouted Kitchen duo!! Thank you so much for stopping by, Lily!! hi Connie, I don’t see the coconut – can you help? this sure looks good. Oops! That was a typo (I first tested this recipe with coconut milk, but it wasn’t as good as using regular milk). Thanks for catching!! very delicious take on avocado, Connie! I’m sure it will taste great. and yet again, beautiful pictures! Thank you so much Savita!! yummy!! 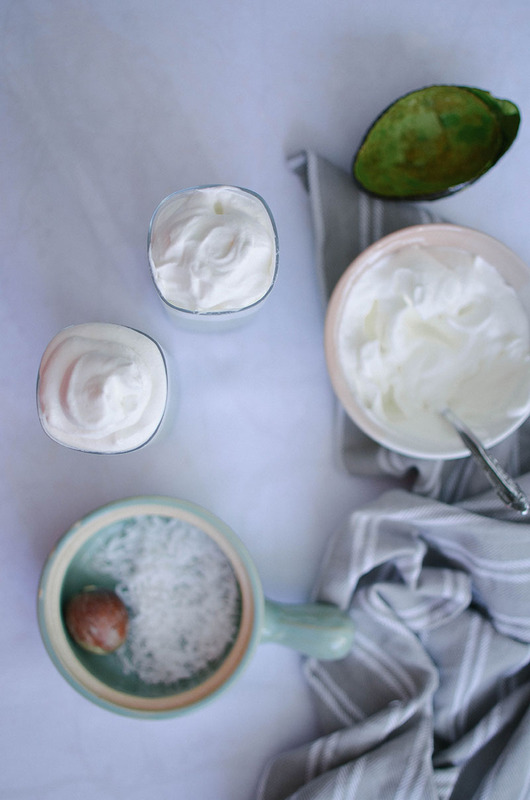 Honey whipped cream sounds absolutely amazing. 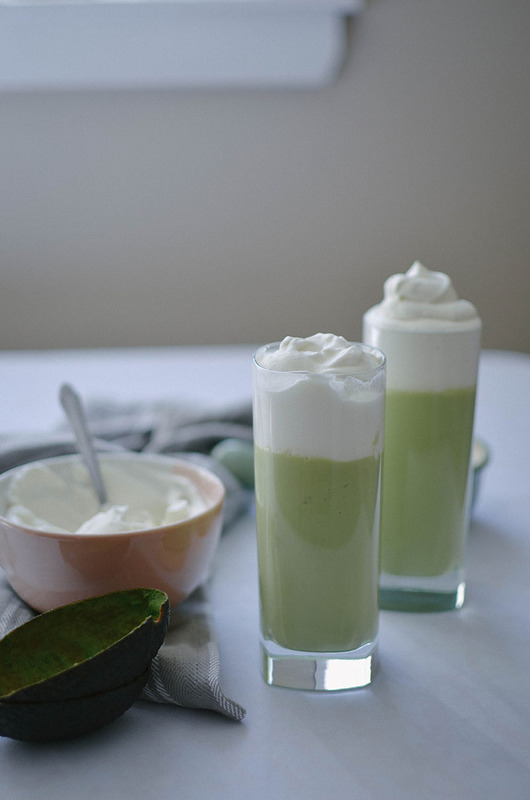 And I like that their is sweet condensed milk mixed with the avocado *slurp*. I’m not going to lie, this looks and sounds amazing. I love adding avocado to my smoothies. This one looks divine! Thank you, Kathy!! 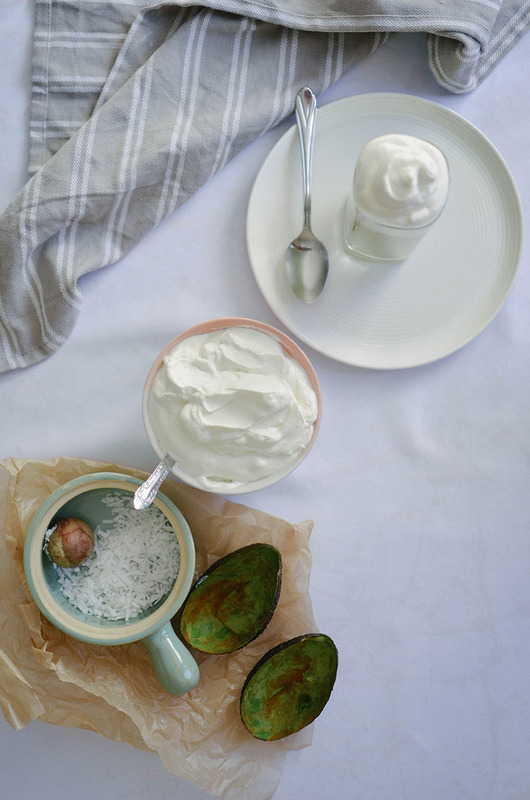 Avocado makes *everything* so much better! I loved reading this post. Connie! And honey whipped cream on top of a smoothie is just genius!! Thanks Liz!!! You are too sweet!! Yum! I love the sound of honey whipped cream, sounds delicious Connie! Pinned! PS: I made tawa pulao but was not able to click pictures 🙁 Will make it again soon and post it!